Explore, Learn, Have Fun! 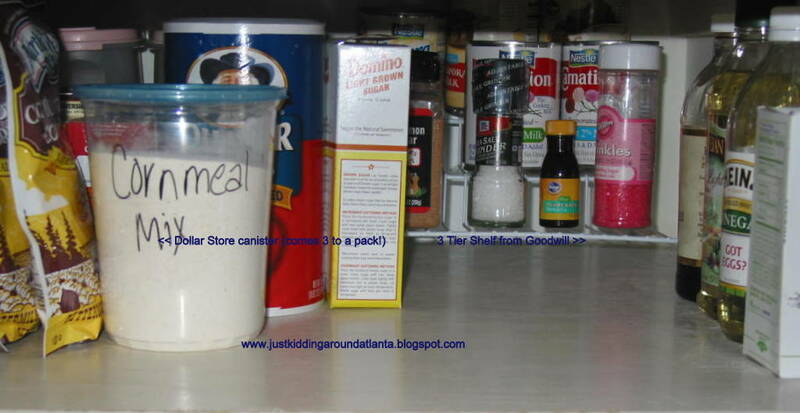 : How to organize your pantry! About a month ago I found this organizer on pinterest. I decided that Amy from Then She Made is a genius!! 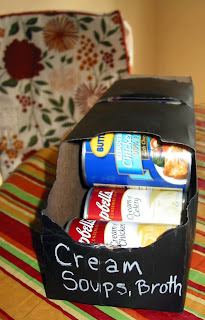 I have a cabinet-style pantry in the kitchen and it can get heavy on the cans - so I loved her idea of repurposing a carton from a 12 pack of soda into a can holder! She used scrapbooking papers, which looks gorgeous, but I had a different idea. You know I'm a chalkboard spray paint addict, right?! See where this is going? 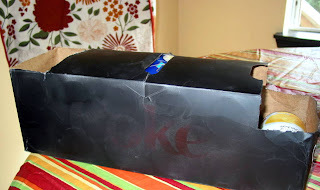 First, I cut a small rectangle on the back of the top - to reload the cans. Then I gave each container a light coat of CB paint all over (I went a little heavier on the top - not so much on the sides, since noone will see them). The front of each container got 3 coats of CB paint. After they dried, I brought them inside and emptied my shelves, lol! Next time I'll write on the front of them while empty, standing them on their ends. It's alot harder to write on them from the front side when they are full! I have one for my soups (but my larger cans of soup don't fit in these), one for tomatoes (crushed, puree, small cans of sauce), and one for fruits. I'll add more for veggies as I gather more of the cartons! This project took less than 30 minutes and used items I already had on hand, so it was easy-peasy and super cheap! If you try my version or Amy's please link back with a picture - I love to see what other crafty mamas out there make! These fit my third pantry shelf perfectly and I think there is room for one more! 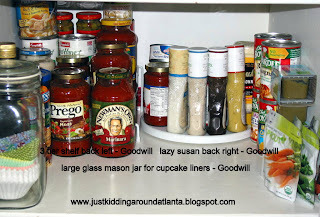 And while I'm at it - I am going to show off some of my recycled pantry helpers I got at Goodwill & cheap containers from Dollar Tree! My Goodwill store has a whole aisle of kitchen helpers & gadgets, which often includes little wire shelves, plastic bins, lazy susans and more. I stock up whenever I find them! This shelf holds items for baking. Three tier shelf in back corner holds smaller baking ingredients, plus extracts and an extra salt grinder. 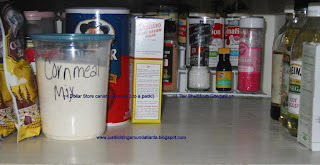 The container holding my cornmeal mix is from the dollar store - they come in a three pack and I love them!! Next shelf down holds large soup cans, pasta sauces, olives, dressings, canned pasta, baby food purees (I add these to everything to give us extra veggies!) , bread crumbs and olive oil . It also keeps my large mason jar that holds all of my cupcake liners! (It's too tall for my baking shelf, so I keep it on the one below). The lazy susan lets me find pizza sauce, dressings, canned chicken or condiments easily. Being organized doesn't have to cost a fortune, and you can recycle/repurpose a variety of things or use items from the thrift store or Goodwill to keep them out of the landfill! I'm back on my Flylady routines starting this week, so getting my pantry back together ROCKS! I LOVE the idea of using the soda carton as a soup container! I am obsessed with organization tips, though I never do seem to pull them off right! Haha! Thanks for these ideas! I am always looking for frugal ways to organize my home.